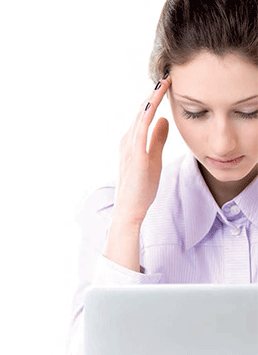 Stress and digestive disorders are the two main health issues that our customers come to see us about. Modern life is so hectic and fast-paced, and everyone is juggling so many things, from work issues to family commitments, that it’s unsurprising that stress is on the increase. People just don’t seem to have the time to slow down and take care of themselves properly. Whenever a customer comes into our store looking for advice for a particular health issue, we always ask them lots of questions about their lifestyle, their diet, exercise levels and any issues that may be troubling them. We also check to see whether they are taking any medication as some medicines can interact with natural remedies. In the case of a person suffering with stress, I would ask them about what is causing the stress, how long it has been going on for and whether it is affecting their mood or sleep patterns. It is important to get this information before recommending any products. Fortunately independent health food stores are a great source of natural remedies for stress. One remedy we would recommend is St John’s Wort, but this can interact with certain types of medication, so it’s important to check what medicine the customer is taking first. Rhodiola is another helpful remedy. This is an adaptogenic herb which is usually available in capsule form. We would also recommend taking a vitamin B complex as this is particularly good for supporting the health of the nervous system. We always recommend vitamin D too, because it’s a classic mood-lifter and magnesium, which is a natural relaxant. Avena sativa, which is better known as the oat plant, is a good natural remedy for soothing the brain and nervous system. It is available in tincture form and is particularly popular among our customers. Passiflora is another good herb for soothing anxiety, which is available in tablet form or as a tincture. Valerian can help too, particularly when the stress is linked to sleeping problems. We stock a valerian and hops tincture which is probably one of our bestselling products as it helps both stress and insomnia. Herbal teas such as chamomile and Melissa are good for drinking just before bedtime to help people switch off and wind down. A few drops of lavender aromatherapy oil in a burner can help to create a relaxing atmosphere before going to sleep. Or you could put a few drops of the oil on a tissue and place it under the pillow before going to sleep. In terms of general advice we would always recommend that our customers follow a balanced diet full of fruit and vegetables and wholegrains. It is important to make time to eat properly without rushing to allow your body to properly digest your food. I think it’s also helpful for people suffering with stress to look at their thought processes and try to find positive solutions to their problems. Also, finding someone to talk to about your problems can ease the burden. Finding a different opinion can often be helpful. Getting outside and immersing yourself in nature can be very calming and soothing. A walk in the park can instantly lift your mood. Yoga is wonderfully calming too and can really help to ground you. Meditation can help too – just finding a spare five or 10 minutes a day to clear your mind can really help to ease stress. Last of all, I would recommend finding a friendly cat to stroke because they are so soothing! 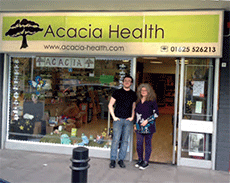 Acacia Health has been based at 2 St Anns Parade, Wilmslow, SK9 1HG for nearly three years. Manager Julie runs the store most days with additional help from her son. This independent health store stocks a wide range of vitamins, minerals and supplements; herbal products; aromatherapy gifts; natural and organic health and beauty products; vegetarian, vegan and free-from foods and pet products.